Earlier this year, idgroup was also recognized with a Fourth District American Advertising Federation’s Angel Award, which recognizes firms throughout the state of Florida and the Bahamas for their contribution and work for public service initiatives and campaigns for non-profits. The firm was recognized for its 2016 rebranding and advertising work with local nonprofit Autism Pensacola, the fourth recipient of Brand on Us™, an annual grant which awards a deserving local nonprofit with a comprehensive rebrand worth over $150,000. Learn more about idgroup at https://idgroupbranding.com/. B Lab is a nonprofit organization that serves a global movement of people using business as a force for good. Its vision is that one day all companies compete not only to be the best in the world, but the Best for the World® and as a result society will enjoy a more shared and durable prosperity. idgroup is a brand transformation company with a fundamentally different approach to branding. Since 1989, we’ve helped leaders tear themselves away from routine thinking, to embrace and leverage branding as an engine for reinvention and innovation. We help engage their stakeholders in fresh, new perspectives to tell and live a vivid brand story, and— as a result—achieve brand clarity and elevate their brand’s value and reputation. Learn more about us at https://idgroupbranding.com/. 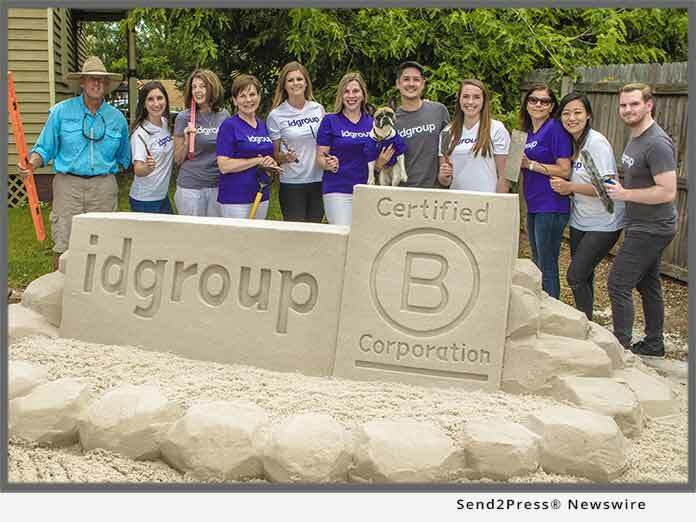 *Photo Caption: The idgroup team and Rick Mungeam, world-champion sand sculptor, celebrating B Corporation Certification outside of their downtown Pensacola office.